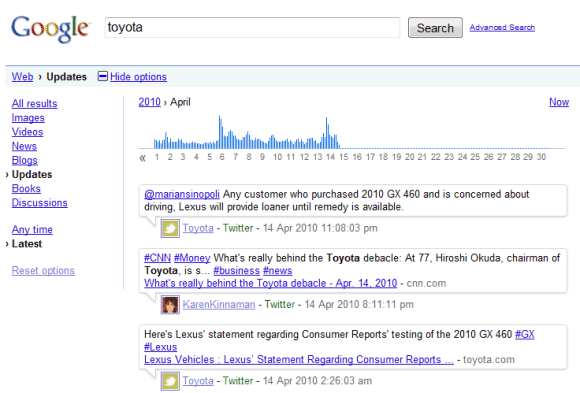 Google's real-time search results have been enhanced with a timeline restricted to Twitter messages. "The first page will show you the familiar latest and greatest short-form updates from a comprehensive set of sources, but now there's a new chart at the top. The chart shows the relative volume of activity on Twitter about the topic," explains Google. For now, Google's timelines show Twitter messages posted since February 11, but Google promises that they will be extended to the entire Twitter archive. After all, Google paid Twitter to have access to the data. Here are some examples of searches that show the timeline: [Toyota], [Android], [Shakespeare], [Happy new year]. 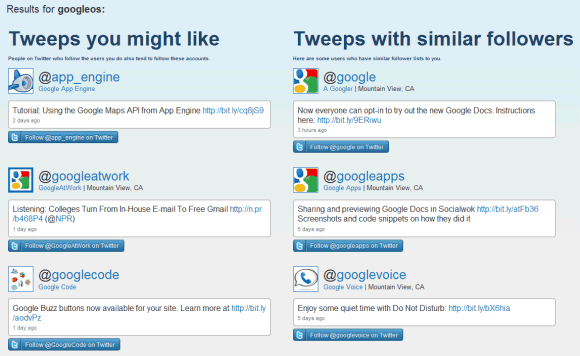 In other Twitter-related news, Google Labs launched Follow Finder, a new service that recommends a list of Twitter users to follow. Google analyzed Twitter's social graph and it's able to recommend other Twitter users that are followed by people who follow the users you do. Follow Finder keeps suggesting people already follow. Obviously a service very much still in 'beta' stage.